I had a mismatched piece of furniture that just did not suit the room anymore (it was an old desk that I have had since I was in my teens) and I have been thinking for a while about getting rid of it for something a bit more stylish and in keeping with the room. Along with this I really fancied a statement shelving piece to display my ever-growing collection of candles and other decorative bits. I love looking on here for inspiration whether it be a DIY project, craft project or travel planning, there is always something to discover. I noticed that there were quite a few ‘Ikea hacks’ which really gave me the inspiration of what furniture I would like and how to jazz it up. So off I went to Ikea in search for the ever famous ‘Kallax’ shelving unit. I had measured up space and calculated that the square x4 box unit would fit, with a bit of room around each side. When in Ikea I was inspired with one of the displays and found that if I added an x2 box shelving unit to the x4 box one, it would fit perfectly in my designated space. I then looked at the inserts and spotted the gleaming glass door with glass shelving, and immediately bought three to go into the top three box spaces. The first piece of furniture found! Now onto the glass shelving unit that I had seen quite a few hacks on how to jazz them up. I had browsed Ikea’s website beforehand so had an idea of what I was looking for, but ever the organised person that I am I forgot to write down what the other shelving unit was called. This really did not help with finding the glass shelving unit in the massive array of other shelving units available. I found a computer in store to search for it, I now know it is called the Vittsjo shelving unit and found out that it had sold out . Despair! How was I going to create the masterpiece that I had been planning and Pintersting about?! Amazon to the rescue…I found a lovely styled glass unit that came in several tiers. I opted for the 5 tier version as looking at the measurements it looked like it would fit perfectly into the corner of my room. The glass shelving of choice: Hartley’s curved corner shelving unit in a silver and clear glass. It was perfect for what I wanted and was a fraction of the cost! Long story short: I bought x2 kallax shelves from Ikea and a curved glass shelving unit from Amazon, all within the mind of doing some form of DIY to it and jazzing them up to fit in which my room’s decor. 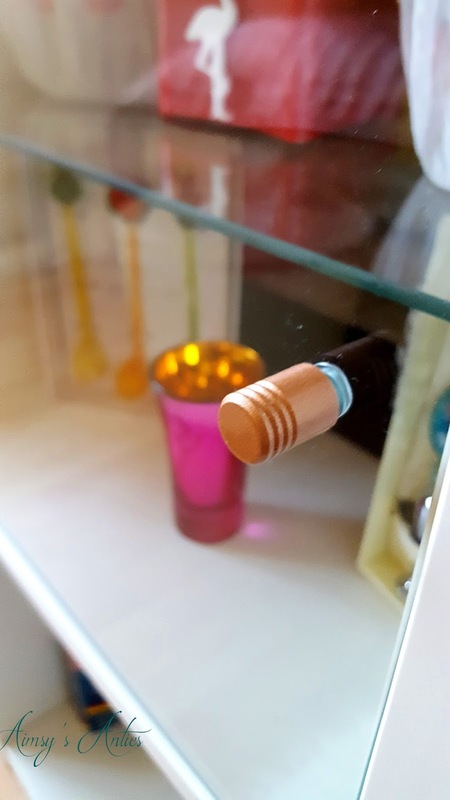 So my idea was to have the hinge covers and handle on the kallax glass shelf inserts to be a copper/rose gold type colour, with the curved glass shelving unit being the same colour. 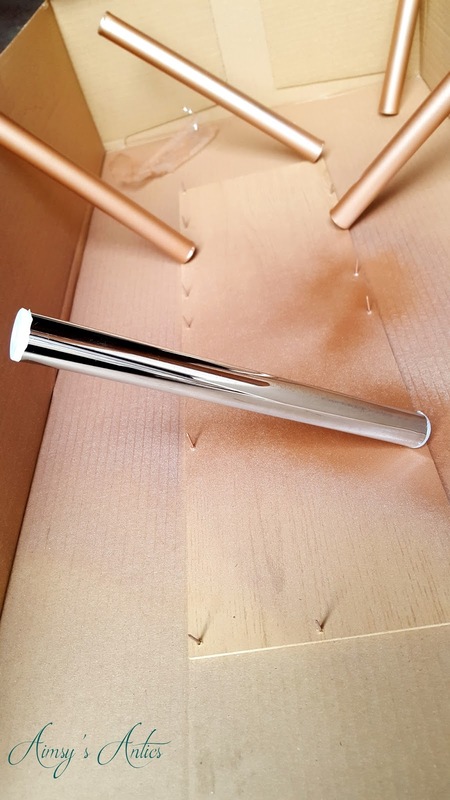 I think I have stated before at how indecisive I can be and I really struggled to choose which spray paint to buy when I visited my local Wilko’s so, of course, I wasted money and bought several shades of golds and a copper, not forgetting a lacquer to seal and add shine. 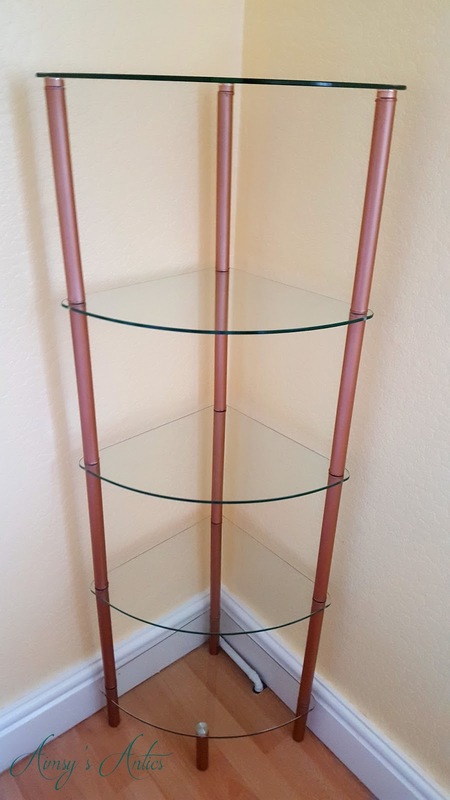 I also bought different marble and copper vinyl/ sticky back plastic to adhere to the top of the shelving unit and the individual glass shelves on the curved unit. I bought these on amazon – white/Grey marble, white/brown/gold marble, and copper. The marble effect is also available at Wilko’s (but I didn’t realise this at the time. Below I will demonstrate how I up-styled my furniture. Please note that this is based on the shelving units that I purchased and the steps may need to be carried out differently with other shelving units. – Make sure that you have a big enough area that is well ventilated. – Make sure you have something covering the ground – I chose to save the cardboard boxes my kallax shelves came in and used these. – Shake your spray paint well, this should allow the paint to mix an spray more even. 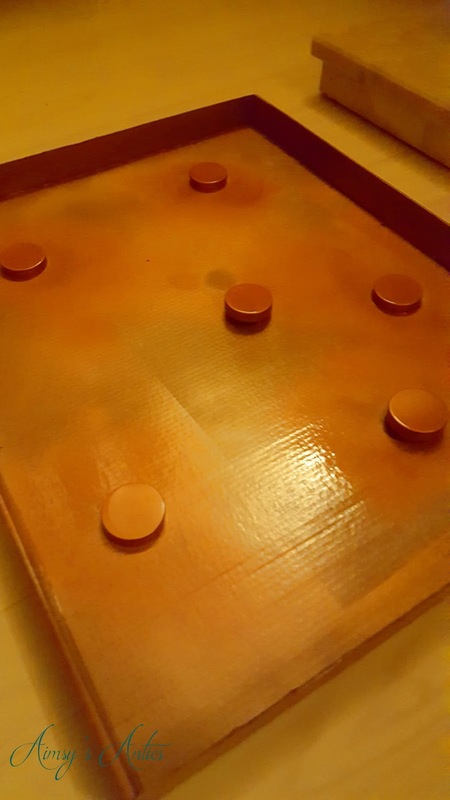 Place individual pipes (frame) onto cardboard vertically. Using blue-tac or plasticine to secure them. I used a piece of wood with nails sticking up to stand the pipes up. Select desired spraypaint- shaking this well- and apply with light even sprays. Be careful not to be too close as this will cause the paint to ‘splodge’ and run. Dependent on spray paint, allow drying for the suggested time between coats. Ensure that the pipes are fully covered evenly. Once desired colour/shade has been achieved and is fully dry, apply the lacquer, again in light even coats. I think I applied three coats in total. Wait for the pieces of the frame to dry. Now, this is where I deviated from my plan to apply the marbled vinyl to the glass shelving. I thought that the unit I had painted looked better without the added marble. I guess this would be the stage where you apply the vinyl marble to the glass shelving. The shelves I have, have three small holes in each corner to attach each pole of the frame to. If adding the vinyl you would have to ensure that these holes are cut out to allow the frame to be assembled. I think the Ikea glass shelving unit is built differently, meaning the frame can be assembled without the glass shelves, which are placed in after. This would be easier to marble than the unit I have. Assemble the pieces of the shelving frame, following provided instructions. With the unit I purchased, some of the poles of the frame appeared wonky when attaching, and the shelves did not always line up. This meant that I had to pull the poles slightly to make them line up to the holes in the shelves. There is a slight wobble to my shelving unit, however, this is not a problem for me, as I will rarely be touching/moving the unit about. There you have an up-styled glass shelving unit. Quite a simple and easy up-style and would only take a full day to complete, if you have the time. Very similar steps of the above unit. Spray paint the hinge covers and door handle with the same spray paint used above. Again ensuring these are on a flat surface and are accessible from all angles. Evenly spray the paint in light coats, until desired shade is obtained. Apply the lacquer and allow to dry. When dry, add these to the glass shelving inserts of the Kallax shelves. There you have a slightly updated kallax shelving insert. I did plan on applying the marbled vinyl over the top of the shelving unit, however, again I felt that the unit looked better without this and looked better in my room. I think the shelving unit matches my existing furniture better without the added marble. Have you up-styled some of your furniture to fit in with the aesthetics of your room? Feel free to leave a comment below, or share the post.